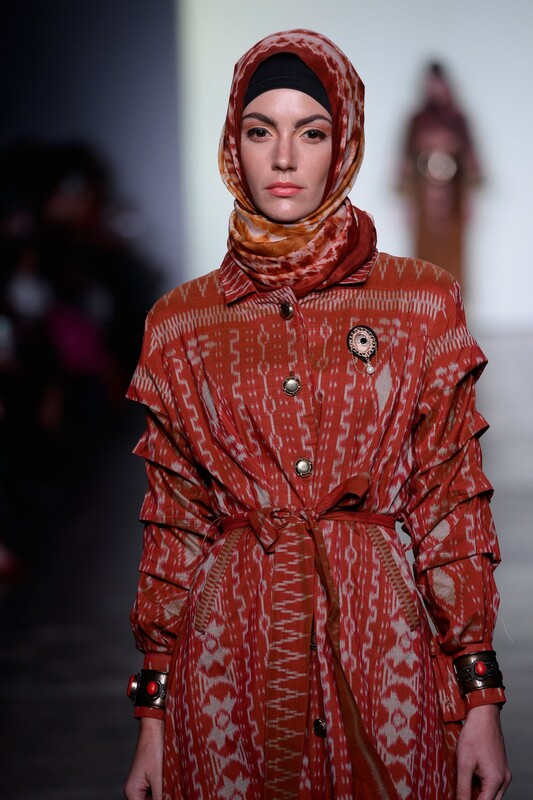 Vivi Zubedi brought her signature modest wear to the mainstream with her Fall/Winter 2018 collection runway show at Industria as a part of NYFW: The Shows. 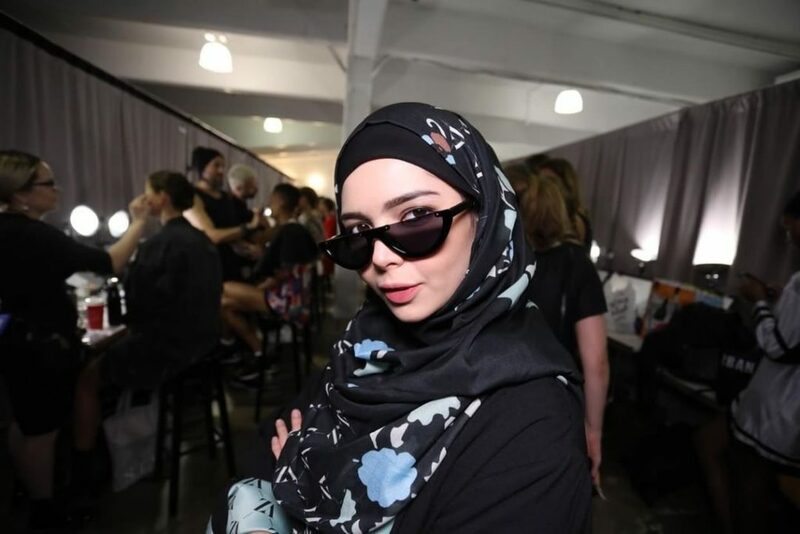 The fashion designer traveled from her home country, Indonesia, to display her embellished, statement RTW and hijab collection to the US fashion industry. Zubedi’s talent for combining textures, patterns, and embellishments was apparent. 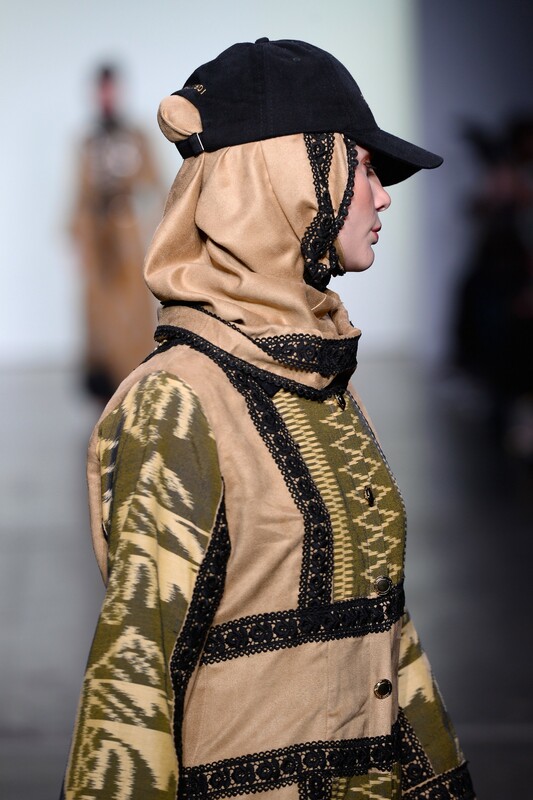 The designer mixed traditionally Muslim silhouettes like hijabs and abayas with sportswear elements like printed sneakers and gold embellished baseball caps. 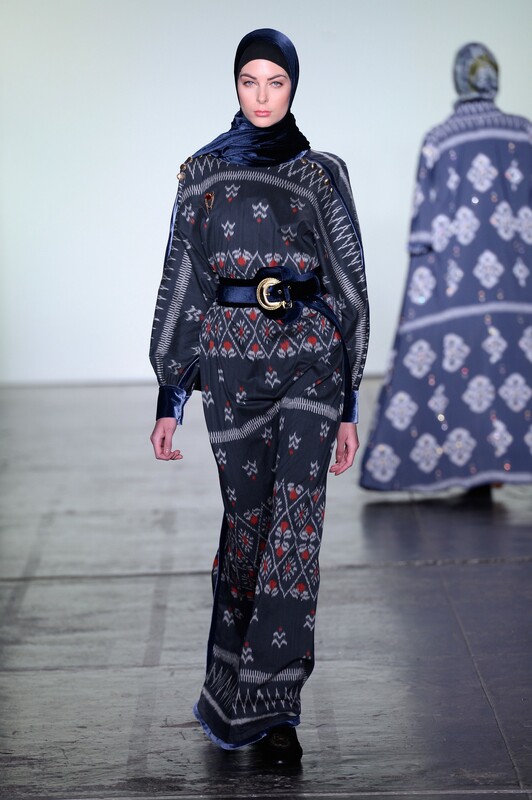 Written across the caps and select velvet jumpers in the collection was “Banua Borneo” — a region of Indonesia that Vivi Zubedi wishes to bring attention to. Vivi Zubedi’s collection utilized the weavers’ beautiful original fabrics from South Kalimantan. The difficult techniques used in the process of making these fabrics is what makes them so special. The human resources who created the traditional fabrics are women ranging from teenagers, to adults and elders. Vivi believes these women should be highly praised as they conserve Kalimantan’s traditions. 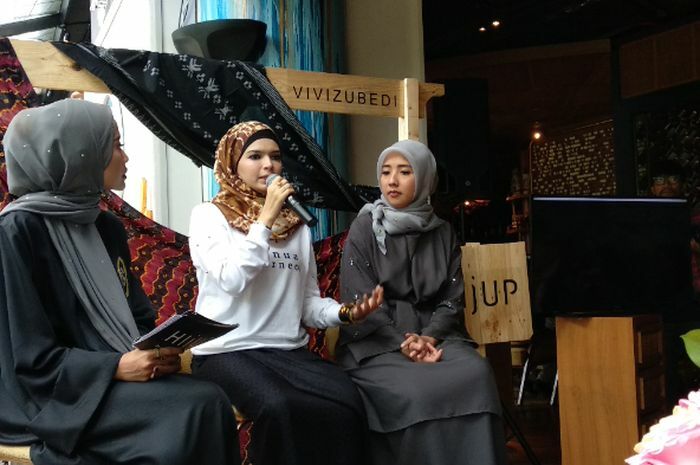 Vivi dreamt to improve the economy of these entrepreneurs by introducing Kalimantan’s traditional fabric to the international fashion industry at NYFW. “When I saw the elderly weavers in the village in South Kalimantan, I suddenly wanted to create a collection inspired by the fashion of their time, the 40s through 60s. I want to make chic and stylish masterpieces with their handcrafted materials. I want this fabric to be the new trend in fashion.” — said Zubedi. A rich, yet earthy color palette of velvet and the subtly printed artisan materials was embellished with flashy gold chains, crystals, and pearls. 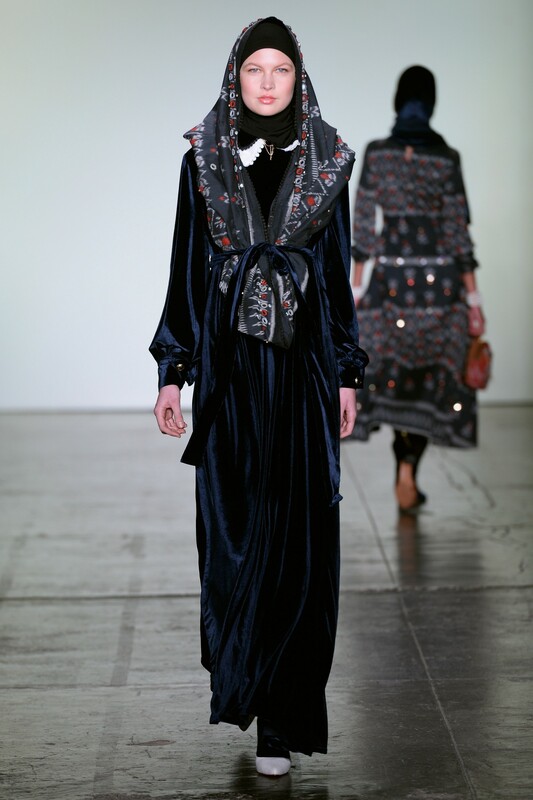 Wrapped coats in black and white polka dot, navy velvet, and ikat printed fabrics were decked out with zippers, beads, girly bows, oversized belts and Victorian collars stole the show along with Zubedi’s stylish sneakers and mini handbags. The show closed with designer Vivi Zubedi graciously walking down the runway in her own design to a standing ovation from the crowd including her daughter who handed her a bouquet of red roses that she took and held close to her velvet Banua Borneo gold stitched top. As the show ended the room of modest influencers, celebrities, editors, buyers, family, and friends stormed the runway opening hoping to try and grab a selfie with America’s next top modest fashion star!